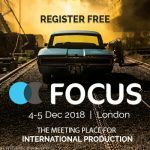 TAC is pleased to announce that we are industry partners in this major production event in London on 4–5 December. Registration is free. The theme and initial programme sessions have been released, with more to follow. TAC will be present throughout, so do get in touch if you’d like to meet there.